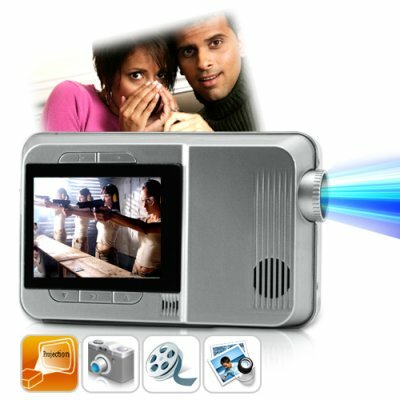 Successfully Added Multimedia Mini Projector with MP4 Player + Digital Camera to your Shopping Cart. New Multimedia Mini Projector for travel or the desktop, and for work or play. This bright output mini projector is a convenient video and picture viewer for use when traveling or setting up something small in your private office or even the nightstand in your bedroom. This Multimedia Mini Projector also includes built-in MP4 Player for watching video, listening to music and viewing photos while you are traveling. Product Overview: This Multimedia Mini Projector is built to be truly versatile for any busy lifestyle, meaning you can use it at your desk while at work, on the train, or in bed enjoying its endless pleasures before falling asleep. When used as a projector, enjoy hooking up AV devices and displaying a big and bright screen onto any wall in your office or home. When used as a travel device, the native MP4 player functions and built-in long life battery mean you can enjoy watching your favorite movies and videos while you are traveling. With playback of over 20 media formats, you can use this to carry just about any of your favorite digital media files. Display: Enjoy viewing your favorite photos and videos with ease with this Multimedia Mini Projector. Watch them with your friends on your bedroom wall or use the 2.4 inch display to view them while you are traveling on the train. Thanks to the multiple input options you can display a variety of digital media files from the internal media player or input your favorite AV devices like an XBox, Wii, DVD Player, etc to view via the bright LED projection or the built-in viewscreen. Rich Feature Set: A simple menu interface, 2GB's of on-board flash memory, 5MP Digital Camera for catching casual pictures, microSD card slot for adding 8GBs of additional entertainment, and the built-in internal li-ion battery mean this Multimedia Mini Projector has many possible uses wherever you are. In addition, this unit even has an AV OUT option which enables you to extend your image onto a TV screen or monitor. If you need a multi-purpose mini projector for AV and digital media, they don't get any better than the DC13 Multimedia Mini Projector! This multifunction Multimedia Mini Projector with Digital Camera + MP4 Player makes the perfect work and travel companion for anyone who has limited space but wants to enjoy their multi media entertainment in a grand scale. This item is a winning resale item for any internet storefront or eBay shop. Click "Add to Cart" now,and we'll express ship you a sample right away. This cool tech gadget is brought to you by the leaders in china wholesale electronics, Chinavasion. Enjoy bright large screen entertainment up to 42"
Depending on use, the battery can last up to 8 hours (up to 8 hours for MP4 Player, up to 1.5 hours using the Projector). A lot of factors such as the type of media being played back will affect the overall life of the battery. How do you exit back to the main menu, there is no return key? To return to a previous menu, long press play. Reading the user manual will give you many tricks to simple navigation between menu options and functions. a good idea for the mini projector with camera function.